13 IC products forecast to show double-digit growth, led by a 39% surge in DRAM sales. In its Mid-Year Update to the 2018 McClean Report, IC Insights updated its forecast of sales growth for each of the 33 major IC product categories defined by WSTS (Figure 1). IC Insights now projects that seven product categories will exceed the 16% growth rate expected from the total IC market this year. 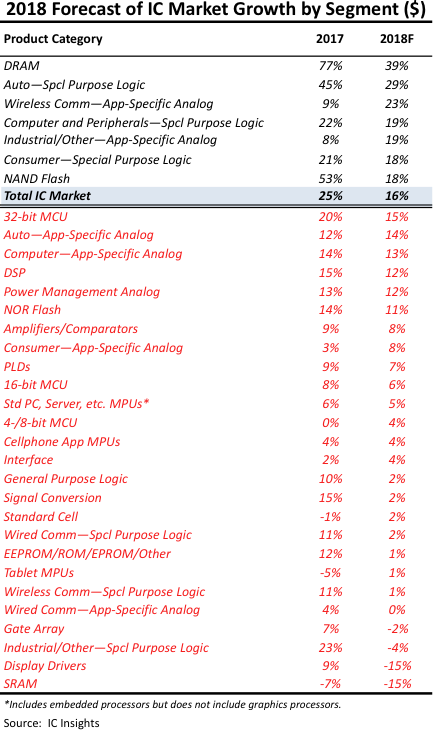 For the second consecutive year, the DRAM market is forecast to top all IC product segments with 39% growth. Overall, 13 product categories are forecast to experience double-digit growth and 28 total IC product categories are expected to post positive growth this year, down slightly from 29 segments in 2017. Rising average selling prices for DRAM continued to boost the DRAM market through the first half of the year and into August. However, IC Insights believes the DRAM ASP (and subsequent market growth) is at or near its peak, as a big rise in DRAM capital expenditures for planned capacity upgrades and expansions is likely put the brakes on steep market growth beginning in 2019. In second place with 29% growth is the Automotive—Special-Purpose Logic market, which is being lifted by the growing number of onboard electronic systems now found on new cars. Backup cameras, blind-spot (lane-departure) detectors, and other “intelligent” systems are mandated or are being added across all new vehicles—entry level to luxury—and are expected to contribute to the semiconductor content per new car growing to more than $540 per vehicle in 2018. Wireless Comm—Application-Specific Analog is forecast to grow 23% in 2018, as the world becomes increasingly dependent on the Internet and demand for wireless connectivity continues to rise. Similarly, demand for medical/health electronics systems connectivity using the Internet will help the market for Industrial/Other Application-Specific Analog outpace total IC market growth in 2018. Among the seven categories showing better than total IC market growth this year, three are forecast to be among the largest of all IC product categories in terms of dollar volume. DRAM (#1 with $101.6 billion in sales), NAND Flash (#2 with $62.6 billion), Computer and Peripherals—Special Purpose Logic (#4 with $27.6 billion) prove that big markets can still achieve exceptional percentage growth. Additional details and trends within the IC industry are provided in The McClean Report—A Complete Analysis and Forecast of the Integrated Circuit Industry(released in January 2018). A subscription to The McClean Report includes free monthly updates from March through November (including a 200+ page Mid-Year Update), and free access to subscriber-only webinars throughout the year. An individual-user license to the 2018 edition of The McClean Report is priced at $4,290 and includes an Internet access password. A multi-user worldwide corporate license is available for $7,290.